K – pop, Pop, POP!!!! I’m so confused but that defines my relationship with this globetrotting Kpop girl group. Truth is I’ve never been able to love their songs as much as everyone seems to and that especially includes “Nobody.” The whole vintage thing is cool and their live performances are slick but that’s about it for me and them, really. So when the MV for “Two Different Tears” came out, I didn’t feel any urgency to check it out. But I finally did and you know what, I didn’t mind it at all. The concept is fun and Austen Powers-ish allowing them to continue with the whole vintage thing but from a different angle and it has one of the MADtv guys in it (which is great cos I love them all! Lol!). The funniest thing is that I think I like this song better that “Nobody,” and I say funny because all the comments I’ve read so far indicate that people are not feeling it at all! Real late to the game on this one but I don’t care still want to say my 2 cents. First of all I agree with everyone that it reminds me of “Sorry.” Secondly and more importantly, I find I don’t care! I liked “Sorry!” and to be honest, the glutton in me is actually happy to have another song like it! 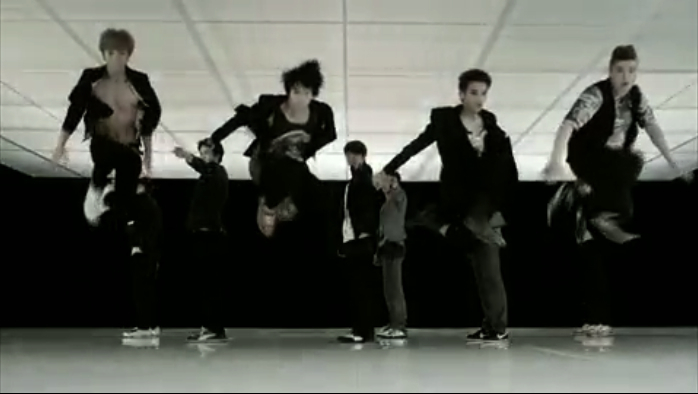 Do I think SuJu is becoming stagnant? Not really, and that’s because I never think of Suju critically like that. I think of them when I get on the treadmill and need endorphins in the form of music and video and in that area they so, so deliver. I watched this vid and after loving the concept to death (that euro Vogue look and everyone’s been working out!!!) all I could think was – dance! dance! club! club! sing! waaah! Lol!!!! You know that this is ultimately what this post is about right??? Ok, had to get that out. A new Big Bang video came out today much to my shock and utter delight! Honestly you’d think I hadn’t seen anything from them in years! Lol! It’s just that despite the fact that I’ve known them for less than a year, I’ve covered pretty much all their material and I. Need. More. Now about the vid. I’m really not into ballads right now but when my boys from BB kick it, that’s a whole other thing and I cannot wait to learn this song enough to torture people with it, kekeke!!! And I am sooooooooooo loving their look in this vid! What better way to show their maturing side than to draw from that ultimate period in debonair men’s fashion? The era of the racketeer!!! This is my favourite era of all time! It’s why I love films like The Untouchables till today, Armani hooked it UP! I’m going to dedicate a proper spazz post to this next so here I will only put the vid so you can get on it if you haven’t.